Convince yourself and experience that the name Strakvlak isn’t chosen in vain. The Strakvlak is constructed by Visser & Visser BV in Breda. Visser & Visser, your partner, almost total supplier with years of experience in cultural and civil-technical area. At first I was rather skeptical, but after having worked with the “Strakvlak” I was quickly convinced. It simply is more effective than the traditional use of a rake and screed board, is much more ergonomic and hence better for your back. 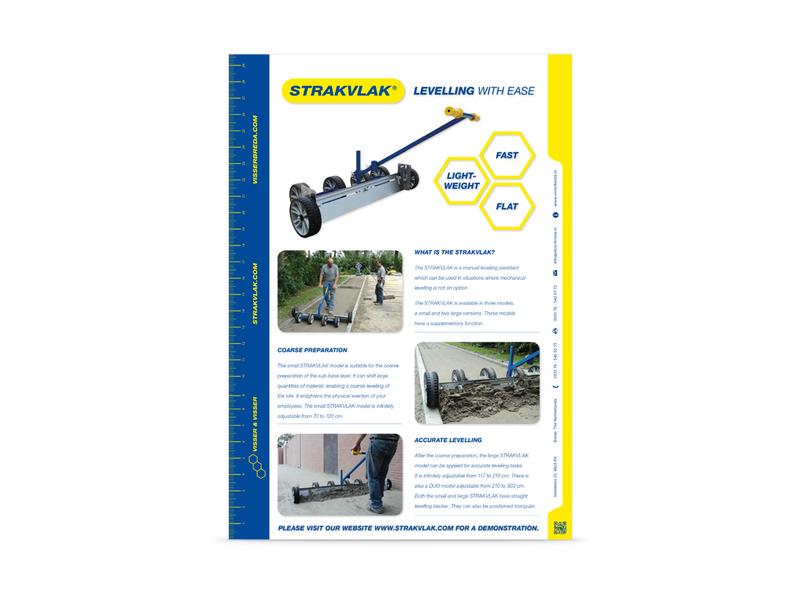 The “Strakvlak” can be adjusted in width with ease. Initially, I was very wary, but we have been working for over a year with the “Strakvlak” now. We use it prior to paving and lawn-making, and are very satisfied with it. The only thing I pity is that I didn’t invent it myself! The “Strakvlak” saves us time in the lawn-making process. It offers many possibilities and advantages. It’s a user-friendly, easily transportable and quickly deployable aid. The “Strakvlak” works formidably. Shifting large quantities of soil is no longer a problem now. The wheels can easily be adjusted. At first I didn’t want to believe in it, but now I would recommend it to everyone. Working with it was truly a revelation. Additionally, the seed rake works perfectly. The “Strakvlak” is a real gem. Now, I can do all preparation standing up straight, which is convenient for any paver. You simply adjust, after which you direct it backwards over the sand bed step by step. Afterwards, you only need a vibratory plate for the finishing. It works 50% quicker, and is better for your back. The base handle can be adjusted in height, so you can set it according to your own length.